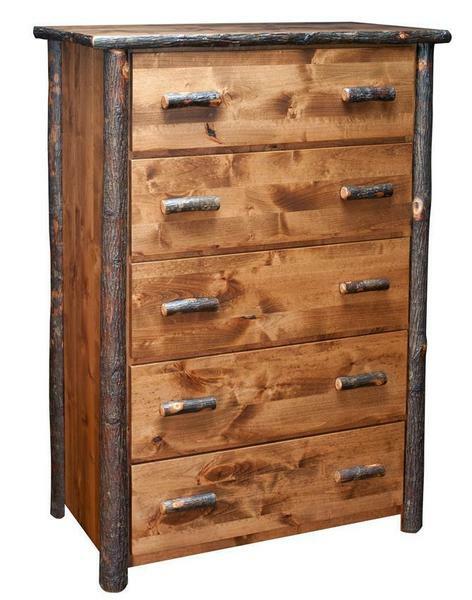 Featuring five roomy, dovetailed drawers with 3/4 Extension KV Drawer Slides and handcrafted hickory sapling handles, this Amish Rustic Bear Lodge Chest of Drawers is functional and beautiful. Choose the main hardwood that you would like to accent the rustic, handcrafted hickory trim and select a natural or stained finish for the perfect piece to incorporate into your bedroom collection. This Rustic Bear Lodge Chest of Drawers is handcrafted from solid hardwood, here in the United States, by highly skilled Amish woodworkers. This ensures that you receive a unique piece of furniture that is heirloom quality and will last you decades. Don't dream of having the perfect looking rustic bedroom, make it a reality with our Blue Mount Hickory Collection. Don't forget to add the Amish Rustic Bear Lodge Dresser and Night Stand to complete your bedroom decor! For questions on the Blue Mountain Hickory Collection, or to start your order by phone, please call one of our Amish Furniture Specialists today! Toll-Free (866) 272-6773.